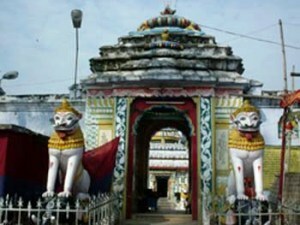 The Shrine of Lord Ladukeswar, known popularly as Ladu Baba is situated here, 100 kms from Bhubaneswar on the Nayagrah Aska Road and 13 kms from Nayagarh town. The city is regarded as Hari (Vishnu) and Hara (Shiva). One of the major Shaivite Shrine,the Ladukeswar Shiva temple is a crowded place with mass of people always waiting to see the Lord. The temple of Lord Siva was built by the King of nayagarh Ladukeswar Singh Mandhata in his own name.Apart from being one of the crowded Odisha Temples,the temple is also unique because it doesnot hve any doors.Rightly so, the shrine is known amongst the populace as the "doorless temple."